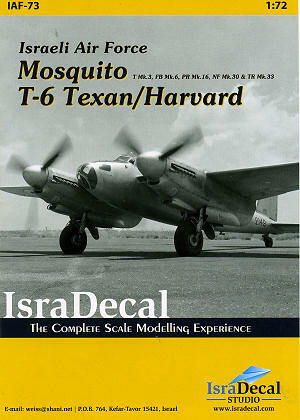 Not many know that the IAF operated deHavilland's wooden wonder, the Mosquito. Most of these were apparently purchased from the French and so a number of different variants entered service. While they were mostly liked by the pilots, the maintenance people regarded them as a headache. Some of these had been rehabbed, but most were not and after years of previous service, well, you can just imagine. Another type that was introduced into the IAF was the T-6 Texan/Harvard. It is difficult to think of any Western influenced air force of the 50s and 60s that did not have some of these rugged aircraft on hand at one time or another. In fact, the T-6 was one of the first aircraft used by the fledgling IAF in 1948. This particular sheet from Isradecal has markings enough to be able to build several of each type of plane. It seems from looking at the instructions that IAF Mosquitos did not have upper wing insignia so you have quite a few to choose from. As for the different variants, you can go a T.3, NF.30, FB.6, TR.33 and PR.16. There are also a variety of camo schemes, though most of these planes were operated in aluminum lacquer overall. Isracast even provides the black exhaust sections many planes had painted on to cover up the stains. The T-6 has enough insignia and such for several planes as well. Unlike the Mossie, the Texan/Harvard did have upper wing insignia, though not all had them on both sides with one side having the aircraft number. So depending on the time period, you'd have either four or six national insignia on these planes. Most of these planes also had yellow fuselage and wing bands. These will need to be painted on, but paint generally looks much better than decals for these things. It is always a good idea to check photos and many are included with the 12 page instruction page along with the usual color profiles. 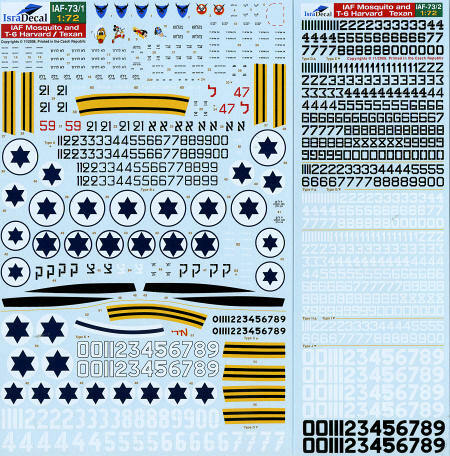 There are a lot of different number styles for both planes so like all IsraDecal sheets, if you have a photo, you can probably model the plane using this sheet. For kits, one will probably use the currently available Tamiya and Hasegawa kits for the Mossie, but there are others from Airfix and Matchbox. For the T-6, Heller has a nice one and Academy has one that is much newer. Again, Airfix has done this aircraft in the past and has the proper aft canopy section for a Harvard. In all, an excellent sheet and one that you should seriously consider for your next project.